How Strongly Do You Support No Kill Efforts in Your Community? | To the Rescue! How Strongly Do You Support No Kill Efforts in Your Community? Many people voice open support for 'No Kill' shelters and rescues in their communities. After all, what is the alternative? To say that euthanizing hundreds, if not thousands, of animals in your community is okay? I don't think that reality sits well with any compassionate individual BUT it is time we started to move out of a naïve conceptualization of what saving more lives entails. We need to understand what we are really asking of ourselves, and those on the front lines in our communities who are attempting to make "No Kill" a reality. What does supporting a No Kill community mean? The days of thinking the solution to the problem of homeless animals is as easy as finding a few more open homes with room for one more animal are over. Being willing to help is one thing. Being educated as to HOW to help is another matter, entirely. The fact is, as more dogs are being offered for adoption that may have been euthanized at one time, the needs for educated pet owners (and foster parents) is increasing. Many rescued dogs need more than food, water, shelter and a person who has always loved animals in order to succeed in a permanent adoptive home. The good news is, we are becoming much better informed as to what it takes to help set dogs up for success. The bad news is, too many people aren't getting the information they need to understand the issues until it is too late, resulting in rescue worker burn out, compassion fatigue, mistrust and animosity among various people who theoretically have the same goals, animals that linger in the system, difficulties finding and retaining good foster homes and the heartbreak of returned adoptions. I'd like to help shine the light on this complex set of issues, providing you with straight talk and real world stories that will help us move in a No Kill direction in a way that is sane, supported, informed and connected. But I absolutely need your help to do that. I travelled to Indiana yesterday to meet Lucy in person. If you have been following this blog, her name and face may ring a bell. She's had an interesting journey since I first introduced her and she could well be the poster child for the next steps in our embracing the No Kill movement. 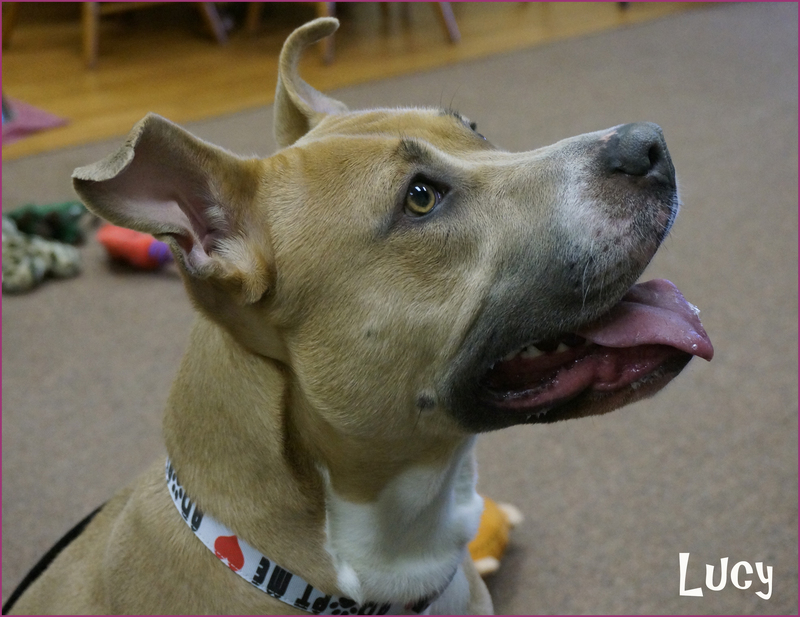 Lucy and her story can do a great service for many, many dogs just like her in the animal rescue system, as well as for those people who work with, foster, and ultimately adopt them. 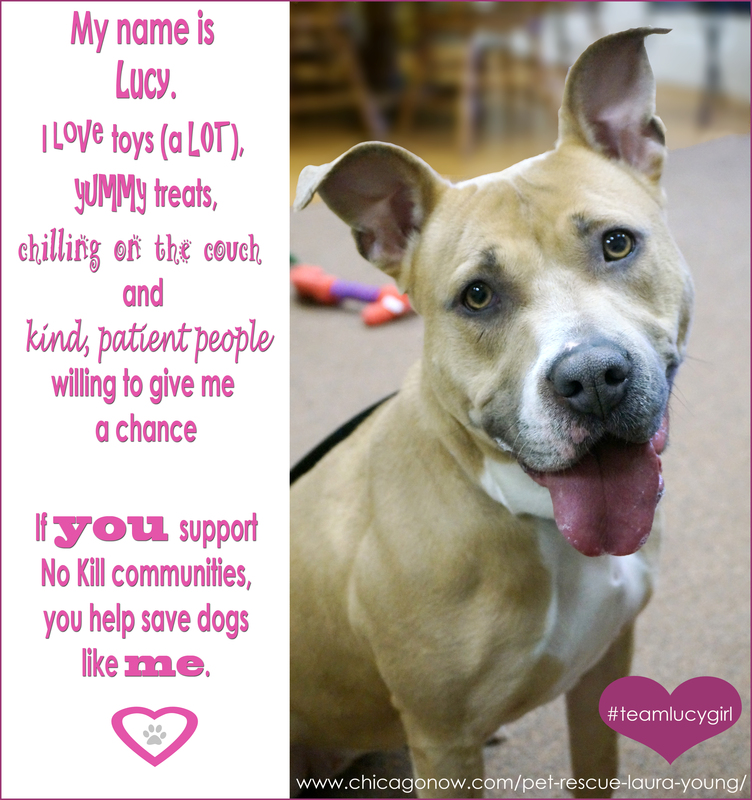 The challenges dogs like Lucy can face tend not to be discussed as openly as they should be with the general public, in part because rescues are afraid that if a dog is struggling in the system that no one will want them. But I have faith in you guys and strongly believe that knowledge is power. I don't think it is asking too much of you to understand that some animals find the shelter experience terrifying. Further, I think you can easily understand that stressed out, frightened dogs can get passed over by adopters, leaving them to flounder in the system even longer, setting them up for a downward cycle unless skilled support services intervene. Happily, Lucy is getting the skilled support she needs and I've been invited to chronicle her journey for you. In fact, you've already met the person who has taken Lucy under her wing. You can read about Dr. Fiia Jokela here. I am thrilled to be able to share Lucy's journey because I firmly believe that positive foster experiences and successful, permanent adoptions hinge on education. We need to support people in how to set themselves, and the animals they care for, up for success. But Lucy's story, as universal as it may be, won't do any good unless people see it. If you are at all interested in animal welfare and supporting rescue efforts in your community, I am asking you to take one small step today by helping this blog get on the radar of those who share your values and would like a frank, well-researched, behind-the-scenes view on these issues. I want you to meet some of the animals, and to hear from some of the people who are working with, fostering and ultimately adopting them. There is so much they have to share for our mutual benefit. Why do I need your help? This blog is run without support or compensation, apart from the willingness of ChicagoNow to let it live here. Being tasked with the full responsibility for research, writing, AND dissemination of the articles is a monumental task for one person. As an individual person with no specific rescue affiliation (built in community), it is critical that I have as much support as possible from you, my readers, in order for my efforts to have an impact. If you are new to this blog, I invite you to explore the posts and if you find them of value, subscribe and let others know what you have discovered here. If you are already a fan and subscriber, please take a few moments to ask those who share your values and interests to subscribe and repost the articles that they find interesting and informative. I'm willing to put in the hours to create informative articles, if you all will join me in the effort to help them get seen. Sound like a fair arrangement? WE, and our willingness to come together as a team, are the best hope for our communities to come to the consistent, compassionate and responsible aid of dogs like Lucy. If you have not yet read these articles, they will give you a good foundation to understand issues that will be discussed here moving forward. Interested in learning more? Then be sure to subscribe! To get a brief notice in your inbox when new posts go up, simply type your email address in the box and click the "create subscription" button. My list is completely spam free, and you can opt out at any time. And be sure to follow me on Facebook for lots of great additional info you won't get here.